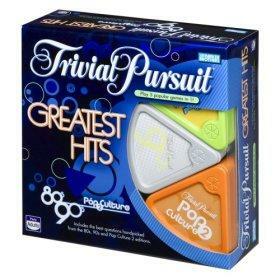 Trivial Pursuit is America's favorite trivia game - at least according to Hasbro, the game's distributor. It's a fun way for 2 to 24 players, ages 12 and up to challenge their knowledge on important, and not so important, facts. Trivial Pursuit was developed in 1979 by two friends in Canada - Scott Abbott, a sports editor with the Canadian Press and Chris Haney, photo editor of the Montreal Gazette - who were big board game players. They sold 1,100 copies of a prototype of the game in Canada before they introduced the game at the 1982 American International Toy Fair in New York City. It was not a success until they joined up with the Selchow & Righter game company in 1984 and sold over 20 million games. In 1988 Parker Brothers acquired the rights to Trivial Pursuit. Hasbro acquired Parker Brothers in 1992 and continues to develop and sell the various versions of Trivial Pursuit today. The ease of play and the broad range of categories make this a fun board game for adults to play with their teenagers and adult children. The game requires a lot of reading which also makes this a great game to help anyone improve their reading skills. At the beginning of the game, each player selects one token and six scoring wedges. Each player tosses the die. The player who tosses the highest number starts the game. All players start in the center of the board in the hexagonal hub. Players take turns rolling the die, moving in any direction they want on the game board, and answering questions from one of six categories upon which they could land. When they answer a question correctly, they collect a colored wedge in the appropriate category "headquarters" at the base of each spoke. Once a player has collected a colored wedge from each of the six categories, the player can start to move towards the hub. When they reach the hub they are asked a game-winning question. If they can't answer the question they must wait for their next turn, leave the hub area, answer a question and attempt to reenter the hub. The winner is the first player to return to the hexagonal hub in the center of the board and correctly answer a question in a category chosen by the other players. As many as 24 players can divide into teams and play Trivial Pursuit. Before the start of the game, each team will select a team captain who will be the "voice" of the team when asking and answering questions. All Trivial Pursuit games can be played with cards from other versions. Even though the categories are not the same in all games, the category colors are consistent. This consistency allows the cards to be easily mixed between versions.